Bunions, a condition known as hallux valgus, affect the joint at the base of the big toe. The term bunion refers to the growth on the side of the foot beneath the big toe that results from hallux valgus. Bunions may be more common in patients who wear pointed shoes, such as high heels or cowboy boots. Wider shoes that fit comfortably may lessen the risk of developing a bunion. Wide shoes can also help alleviate foot pain if a bunion already exists. What parts of the foot are affected by bunions? When the big toe (hallux) becomes misaligned, the tip of the toe bones may point inward to your other toes. As the inward point of the big toe worsens, other complications may arise. The bone directly below the big toe is known as the first metatarsal. The first metatarsal and the hallux create an angle, forming a point on the side of the ball of your foot. A bunion may develop as a response to pressure on this angle, which is often worsened by wearing tight or angled shoes. Initially, this bump is inflamed tissue. As a bunion progresses, the bone of the foot may also thicken, resulting in a larger bunion that can become more easily irritated by walking or wearing tight shoes. One of the main causes of bunions is a recurring pressure or friction on the side of the foot. Bunions occur when the skin and soft tissue of the foot are compressed between the inside of a shoe and the bones of the foot. When the skin experiences constant friction, it will become rough and calloused. The soft tissues of the body will grow thicker when placed under repeated friction. As the bump or bunion gets larger, the problem worsens as more pressure is applied. Both the soft tissues of the foot and the skin become inflamed and painful. To relieve these symptoms, patients should wear less narrow shoes and consider a bunion treatment or bunion surgery. One of the most common symptoms of a bunion is a large bump or growth on the side of the foot below the big toe. This bump is often tender, swollen, and painful. Bunions can even make it difficult to walk properly, as pain from the bunion may alter a patient’s walking pattern. Patients with bunions may have difficulty wearing shoes or finding properly sized footwear. Many patients find bunions to be embarrassing and a cosmetic issue. Some cases of bunions can even cause the second toe to move and rub against the shoe frequently, which can cause more inflammation and discomfort. How can Dr. Rozbruch diagnose bunions? Dr. Rozbruch can diagnose a bunion through a physical examination and an overview of your medical history. Dr. Rozbruch may be able to more easily diagnose bunions if he discovers that you have a family history of bunions. Bunions may also be a hereditary condition and can be more common in patients with certain foot characteristics, including loose joints and tendons, low foot arches, or flat feet. A foot X-ray may be needed so that Dr. Rozbruch is able to better understand the current health of your foot. An X-ray of the foot allows Dr. Rozbruch to measure angles between the foot bones, which can help determine a proper bunion treatment or surgery. Bunion correction typically starts with a discussion of footwear with Dr. Rozbruch. By removing the cause of external pressure and friction, you may experience relief from bunion symptoms. Wider shoes may not be as beneficial for patients with a larger, more painful bunion. Bunion pads are also a hallux valgus treatment that can help to reduce pressure and friction on the foot from the shoe. Another type of bunion treatment is the use of a bunion toe separator, which attempts to shift the big toe back to its original position for proper alignment. What bunion surgeries are available? Unfortunately, some patients may not experience relief through bunion correction or a bunion treatment. In more severe cases, bunion surgery, known as a hallux valgus surgery or bunion removal, may be needed. There are a wide variety of hallux valgus surgery options currently available. Dr. Rozbruch can help you decide which bunion removal surgery is right for you. While bunion removal techniques may vary, each bunion surgery is designed to remove the bunion and realign the bones of the toe. 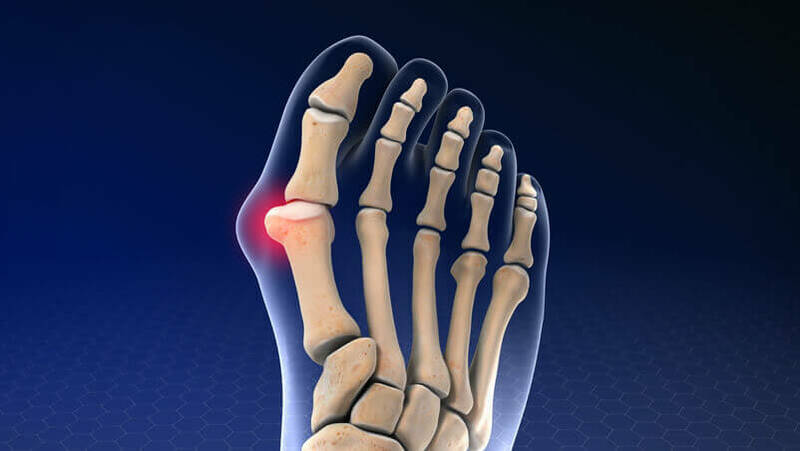 Some of the most common bunion surgeries include bunionectomy, distal metatarsal osteotomy, and proximal metatarsal osteotomy. A bunionectomy may be suggested for patients with a more mild case of a bunion. A bunionectomy is performed through an incision on the side of the foot to remove the bump. The incision will be closed with stitches once Dr. Rozbruch has smoothed the bone where the bunion was removed. In the majority of cases, the bones of the toe also need realignment. Dr. Rozbruch may need to cut the first metatarsal bone in order to realign the bones properly. This procedure is known as an osteotomy. Dr. Rozbruch will discuss this technique with you prior to your bunion removal surgery. Realignment of the toe may be achieved by cutting the bone laterally. Distal metatarsal osteotomy can help to reduce the sharp angle between the first and second metatarsal bones. Distal metatarsal osteotomy is often performed through 1-2 incisions in the foot. Once the bones of the foot have been properly realigned, metal pins may be used to secure the bones in place. After the bones have properly healed, these metal pins can be removed, typically 3-6 weeks after bunion removal surgery. Another technique for toe realignment after a bunionectomy is proximal metatarsal osteotomy. This type of toe realignment surgery is typically performed through 2-3 incisions within the foot. During proximal metatarsal osteotomy, the first metatarsal is cut towards the end of the foot bone. The bones will then be properly realigned followed by the placement of metal pins to secure the bones. Dr. Rozbruch can then begin to realign the big toe by releasing the tension on the outer side of the metatarsophalangeal joint. By releasing the pressure within the joint capsule and tendons of the adductor hallucis muscle, Dr. Rozbruch can help realign the toe. The joint capsule closest to the other toe is then tightened to ensure the toe stays properly aligned. Stitches will be used to close the incision, and the foot will be bandaged. How long does it take to recover from a bunion treatment or bunion removal? Following a nonsurgical bunion treatment, patients who experience foot pain due to a bunion may benefit from 4-6 weeks of physical therapy. During this time, your physical therapist may offer additional advice on footwear and what shoes may help alleviate pain. Specialized foot orthotics may also help to support the arch of the foot and keep the big toe properly aligned. Your physical therapist may suggest limiting vigorous activities for a few weeks to allow the inflammation and tenderness within your foot to subside. Physical therapy sessions can help reduce pain and inflammation within the foot. For patients who have undergone bunion surgery, it may take 2 months for the bones and tissues of the foot to heal. A specific shoe or cast may be placed on the foot following bunion removal. Crutches may need to be used after bunion surgery until your foot has healed enough to support the weight of your body. Stitches are generally removed 10-14 days following bunion surgery. In some cases, dissolvable stitches that will be naturally processed by your body may be used. To monitor progress, Dr. Rozbruch may order foot X-rays to determine if the bones of the feet are healing well and remain properly aligned. How can I learn more about bunion surgery & treatment? To learn more about bunion surgery or a bunion treatment, please request an appointment online or call Dr. Rozbruch’s orthopedic office in NYC at 212-744-9857. Prior to an office visit, please fill out Dr. Rozbruch’s patient forms to expedite your first visit.